Door Closers save lives and energy! What is a door closer? Door closers are mechanical devices that automatically close doors once they have been opened. They are used in office buildings, shopping centres, banks and many other buildings. Most are visible overhead door closers as illustrated. Some are concealed in the floor and covered by a metal plate under the door, and some are mounted inside the door frame at the top of the door and are not visible. Why use a door closer? 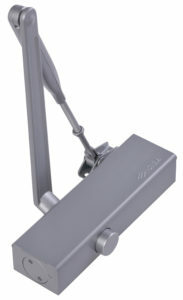 We provide the public and trade with door closers. We also have vast experience and advice to offer with regards to the best installation practices to ensure that your door closers work as they were designed to. Correct installation is critical to both the performance and longevity of the door closer. An error of 10 mm in installation is a BIG error! The two most common errors are – incorrect fitting (i.e. not using the template supplied, or using it incorrectly) and fitting a door closer that is too light for the size of the door or the wind conditions. Door weight is not as important as door size! Learn more about Door Closers here. Are you a builder, shopfitter or shopping center manager looking for door closers? 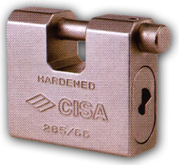 A full range of quality CISA door closers is now also available! See the full range of CISA Door Closers here – and contact us with door sizes so that we can advise you. Contact us on +27 (0)21 555-1720 or info@lockshop.co.za to find out about the door closers we can offer – to help secure your premises correctly.